The projector had originally been painted in a mid-grey crackle finish paint. The main chassis, feed and take-up arms and lens holder all had this finish. However, as explained in earlier posts, the condition of the paintwork was very poor. Over fifty years of weathering plus the effects of ubiquitous lubricating oil had turned the paintwork a dirty grey-green. After removing this old paint, the metal surfaces were scraped, filed and sanded back to a clean finish in preparation for painting. 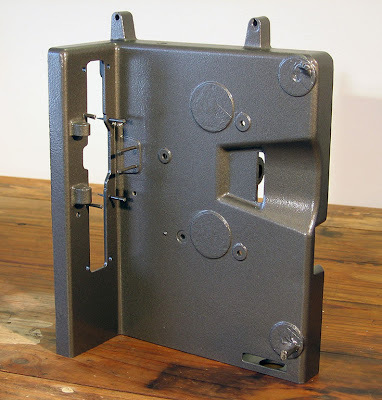 I had decided to repaint the machine using a dark grey hammer-finish paint, readily available in a spray can. This spray-on finish can be applied directly to ferrous metal, but application to Aluminium requires an etch primer coat first. This is also available in the convenience of a spray can. 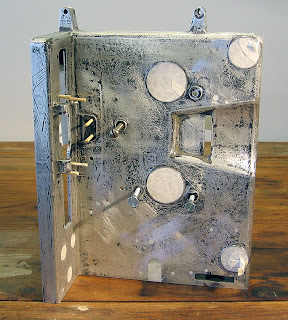 The first task was to spray the outside of the main Aluminium chassis with the etch primer. This was a light grey colour with a very smooth finish. Once that had dried, the finishing coat of hammer-finish could be applied. 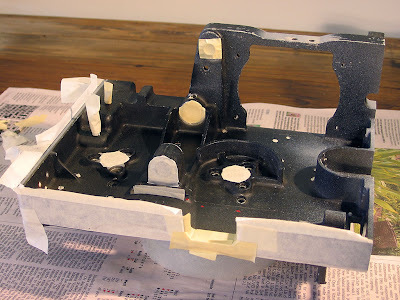 above Here you can see the main chassis after spraying with a few coats of the dark grey hammer-finish paint. Note the masked areas which should not receive paint. Also the use of bamboo skewers to plug small holes to keep the paint out. The painted chassis looked very smart indeed. The interior of the main chassis had originally been painted black. I wanted to re-coat this too, and for that purpose had purchased a spray can of matt black enamel. 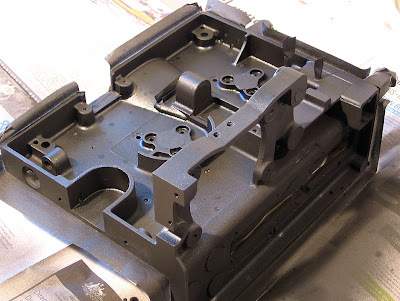 above Here you can see the inside of the main cast Aluminium chassis after cleaning but before painting. Masking tape around the outer edges will keep overspray from the newly painted outside surface. I also masked the bearings for the main drive shaft and the claw mechanism to ensure no paint got into them. above Spraying the black matt paint was straightforward and the extra effort paid off in a uniform and new looking finish. Here you can see the interior of the main chassis after spraying. The masking tape was carefully removed after the paint had dried. above With the chassis painting completed, various smaller pieces needed preparation and painting. Here is the take up arm after removal of the original paint. 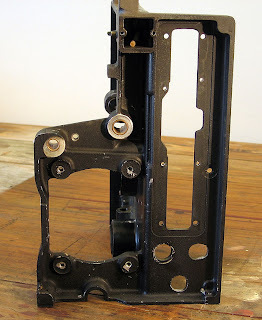 When the projector had been modified in the 1950s, a full size take up spool would not clear the larger base which had been fitted. So my father cut the take up arm in half and extended it with a small brass plate and some one-eighth inch bolts and nuts. 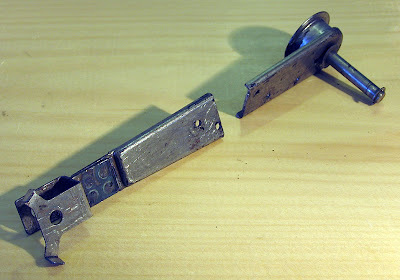 Because I was removing this oversize base, the take up arm could be restored to its original length. 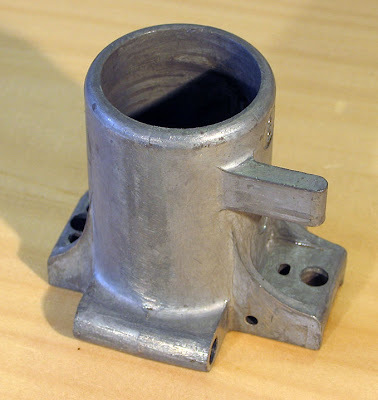 The metal fabricators who made the new base for the projector (more on that later) were also able to weld the two halves of the take up arm together. 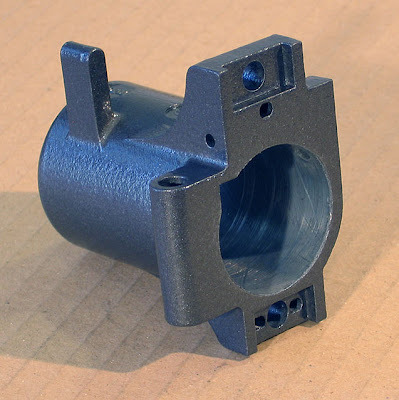 above Here is the welded take up arm sprayed with the dark grey hammer finish. You can see the weld and the filled bolt holes in the middle. Almost as good as a new one! above The feed reel arm was also stripped and repainted. Here you can see it after painting. The spindles at each end were covered in masking tape, still visible in this photo. 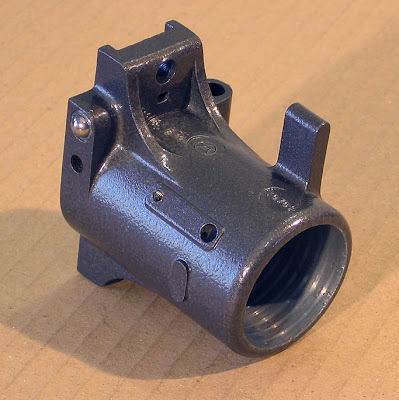 All these small pieces required building up a series of light coats of the hammer finish paint, both to prevent paint runs or sagging if too much is applied too quickly, and to achieve coverage from different spray directions so that all nooks and crannies are painted. 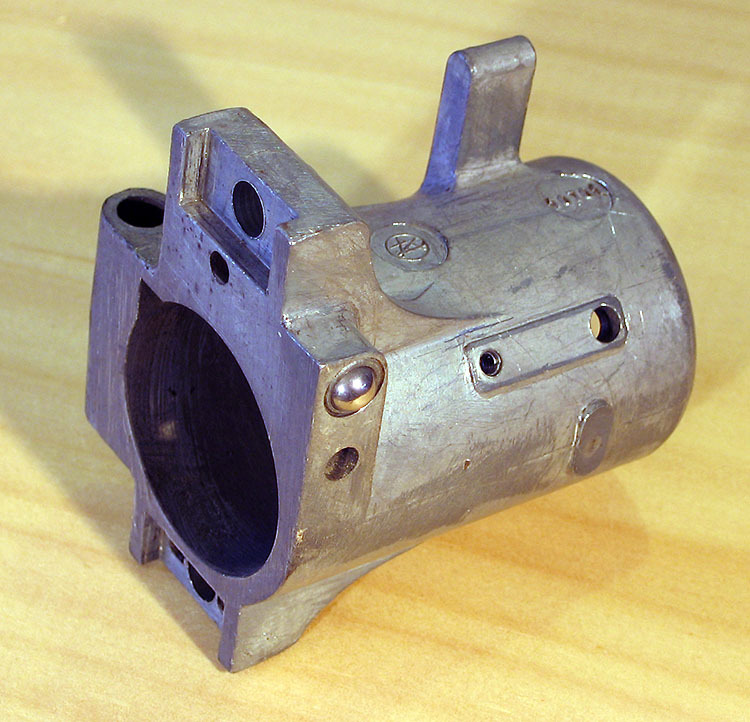 above Now it was the turn of the lens holder — a detailed casting perhaps in a zinc alloy, shown here after removal of the old paint. This was a precisely manufactured and put together piece. 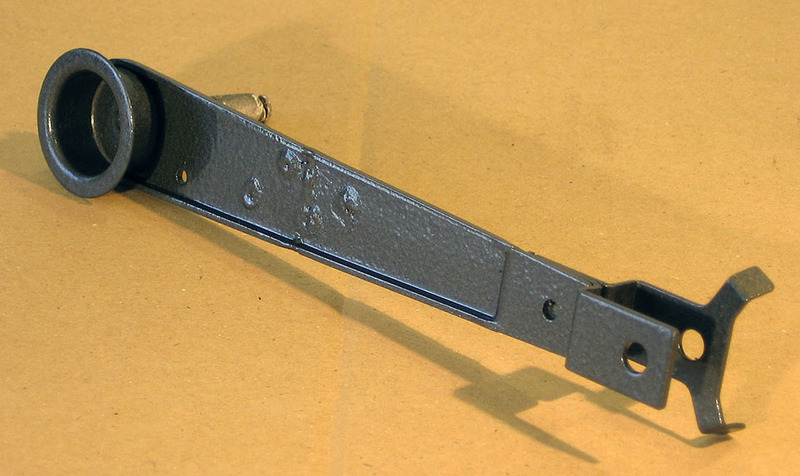 See the photo below of the lens holder before disassembly under the post “More Disassembly”. I carefully dismantled this piece and put the tiny screws and metal parts into labelled yoghurt containers. Only the spring ball which clips the lens holder firmly into position could not be removed. I opted to cover it in a small piece of carefully cut masking tape. above How clean and new it looks with a fresh coat of paint. 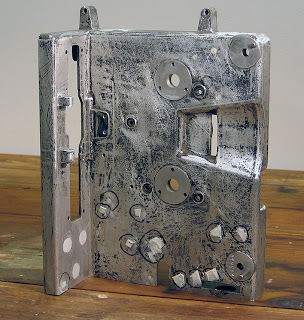 This being a non-ferrous metal, I opted first to use the same etch primer used on the main Aluminium chassis. Once that had dried, multiple coats of the dark grey hammer finish spray paint were then applied. It has taken about a week, spending one or two hours a day, to disassemble the projector into its component parts. Most of the parts have been stored in small plastic yoghurt containers, carefully labelled. Now to begin cleaning everything — because every part, large and small, is covered with oil and grime after fifty years. 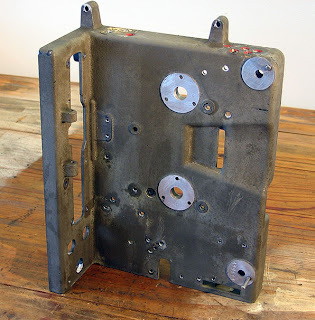 The first challenge is how to remove the paint from the main cast aluminium chassis. A couple of months back I restored a pair of Pathé 9.5mm film winders and discovered that immersing painted metal parts in boiling water made the paint wrinkle and come loose so it can be easily scraped off with a scraper or screwdriver. The paint has to be kept hot or else it starts to stick again to the metal. 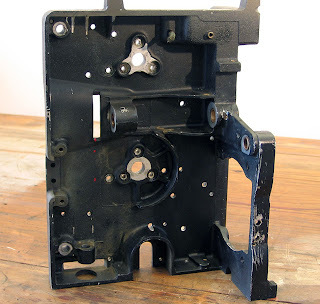 above Here is the cast aluminium chassis with all removable components removed. You can see the poor condition of the paintwork which appears impregnated with oil in places. There is no question of a superficial clean fixing this problem. The paint will need to be painstakingly stripped back to bare metal. Then re-prime the metal and spray with a dark grey hammer finish paint. above Here is the same chassis after cleaning by immersion in boiling water and manually scraping the paint with a screwdriver. Once most of the paint had been remove that way, it was sanded manually with emery paper. There are still traces of the original black undercoat but the surface is smooth enough for repainting. I’ve begun filling the unneeded holes with two-pack epoxy filler, which then needs to be filed and sanded smooth prior to painting. above The inside of the cast aluminium chassis after cleaning doesn’t come up too badly, although the paintwork is scratched or discoloured in places. I’ve taken the decision to re-spray these inner surfaces with matt black paint. above Another view of the aluminium chassis, looking end on. At right you can see the slot where the gate assembly mounts. On the left is the bracket which holds the motor sub-assembly. You can also see the brass or bronze bearings for the main drive shaft (in the centre) and for the axle of the claw mechanism at left. This photo was taken before filling the holes with epoxy filler. above Preparing the chassis for painting has taken some time. Filling the unneeded holes has required two or three applications of epoxy filler — filing the excess off each time and then filling any small cracks or crevices which are left. The remaining holes and the previously unpainted faces where the reel arms and the sprocket holders go need to be protected during painting. Here you can see masking tape applied to these areas. Small holes have been plugged with bolts or with bamboo skewers with their tapered ends pushed into the holes. 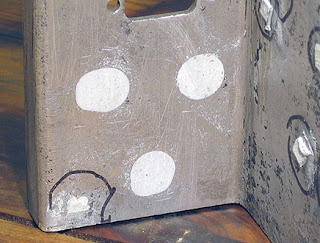 above Here is a close-up of the holes which originally housed the motor and lamp switches and speed-control knob. These controls were removed by my father when he modified the projector in the 1950s and the holes were covered with a metal shim. Here the holes have been filled with epoxy putty and then filed and sanded flat. All is now ready for the painting operation.